Jesus still provokes doesn't he? "Allurement" is an illegal method of conversion in India but apparently not an illegal method to harass and frame Christians. I guess what's good for the goose isn't applicable to the gander there. great resources, well described, especially cool is this Greek NT site. The word deacon (and deaconess) is derived from the Greek word diakonos (διάκονος), which is often translated servant or more specifically waiter. Some believe that the office of deacon originated in the selection of seven men (among them Stephen) to assist with the pastoral and administrative needs of the early church. (Acts of the Apostles, chapter 6). Deaconesses are mentioned by Pliny the Younger in a letter dated c. 112 (see Historicity of Jesus#Pliny the Younger). Let’s just dream for a minute! Pretend we have an unlimited supply of money and 1,000 of the most gifted preachers, organizational guru’s, and team builder’s all built into one. Let’s start 1,000 churches over the next ten years where each one will grow to at least 2,000!!!!! Those churches would change America overnight! WRONG – WE JUST DID THAT!!!!! In the past ten years, that very thing has happened and yet there are numerically less people in church than ten years ago. My alma mater is no Christian school, but i'm pleased with those who comment on anti-life editorials. One commenter opposed to abortion is Muslim. one organization that i hadn't encountered before was this one, The God Story. They provide an 80 minute summary of the key stories in the Bible from Genesis to Revelation, something New Tribes Mission has been doing for awhile. They claim a high success rate with their material where Jesus alone stories haven't inspired many. I'm wondering if any M's who read this might have used this material. more simple and obvious interpretation in the context of that day, not ours. "Police believe that after the girl told her Muslim family of her conversion, her father grabbed a kitchen knife. They suspect the mother stepped between the father and the daughter resulting in the mother's death." Went to a Calvary Chapel Missions Conference at CC Spring Valley in Las Vegas this week. Good stuff to think about. As i pull out all the material and review it, i'll share some links and notes and reflections. the difference being Malaysia is a Muslim country, where interfaith marriages are forbidden but conversion has to be approved by a religious court. Guess how often that gets approved? A satellite radio program is directed toward reaching those under 30, pray for fruit. Growing underground churches; ninety-five percent of the members are under age 30. Pray God will be glorified in every person and situation. 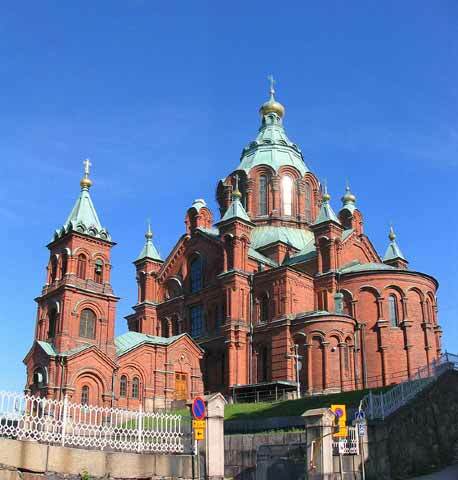 i remember visiting the massive Orthodox Church in Helsinki Finland and being amazed at the lack of seats, then shocked to find out that people would stand for hours at a time. In this post, Dan Kimball notices that standing wasn't the only option but also kneeling or falling prostrate. The idea wasn't vertical pews. Now i'm intrigued. what if chairs were only an option. what if bean bags were included as an option. what if kids were allowed to burn a little energy in service? This is the site that actually got me started thinking about new construction that is ecologically considerate. Update: Apparently Scott Adams took the link off his site. Here is another site with pictures. You can see more images if you search Google images as well. The A-Team asks, "Here's my question:Why are normal people on the left obsessed with conspiracy theories?" The future author of Don Quixote, Miguel de Cervantes,served on one of the Christian galleys in what he called the greatest naval sea battle in history and the most important to that time for the safety of Europe. The Turks had been massing an enormous fleet for an invasion of Italy. The preparations began to be reported on many months in advance. It was the year 1571 when that fleet was gathered near a port in Greece, not far from the Gulf of Lepanto. This is a personal reflection on the shooter of the Amish from an uncomfortably close perspective. "The survey estimated that Pentecostals and charismatics together comprise at least half the population of Brazil, Guatemala and Kenya, and 44 percent of the Philippines. They make up about one-third of the population of South Africa and Chile and nearly one-quarter of Nigerians and U.S. residents. The figure for South Korea is smaller, at 11 percent. In India, the poll was limited to three states with large Christian populations, so a national estimate could not be made.The study found Pentecostal beliefs have a strong hold in major churches in many countries." Flooding triggered by seasonal monsoons in India have recently left hundreds of Dalit villages swamped as a result of overflowing rivers and dams. Some areas received two years' worth of rainfall in three days; and in the Barmer District of Rajasthan, both high-caste families (the wealthy) and low-caste families (the poorest) -- the latter known as Dalits or untouchables -- were marooned on sand dunes.When camps were set up for the displaced, however, members of higher castes chased Dalit families away, denying them food and clean drinking water. But K.P. Yohannan, founder and president of Gospel for Asia (GFA), says the Christian ministry's missionaries are reaching out to assist all victims of the floods, regardless of caste. "We have given top priority to work among these Dalits during these times of flooding and crises," Yohannan notes. "Many hundreds of our workers are bringing food, clothes, and water and working among these people," he says. Justin's blog links to this news story, with quotes like One signatory, Debbie Findling of San Francisco, described her difficult decision last year to have an abortion after tests showed that she would bear a son with Down syndrome. "The Holy Spirit is here to reawaken people," says Reverend Laldawngliana, a spokesman for the Presbyterian Church of India in Shillong. He says similar religious experiences proclaimed the beginning of a reawakening in the region in 1906, just two years after the last great revival in Wales. The Presbyterian Church celebrated the centenary of the revival with special congregations and prayer services in April. September 29 (Compass Direct News) – Seven Christians working with the Indian Missionary Society (IMS) in India’s Gujarat state were released on bail this morning. The group was charged with attempted murder after Hindu extremists waylaid and assaulted them last week. Extremists beat the group, took their valuables and warned them of dire consequences if they continued to share the gospel in the area. One of the extremists, Kanji Nayak, then filed a complaint against the eight, claiming that the Christians had tried to shoot him after he refused to convert. An eighth member of the group, Pastor Dasrath Nanji Dilwad, remains in judicial custody and his case has been transferred to the High Court. Dilwad was also charged with misuse of a firearm.